Like many others, I got my start with a .22—a well-worn Winchester Model 67A complete with a 27-inch barrel, open sights with a brass bead and a manual wing safety. I still have that little gun, and it brings back memories of those fun-filled summers on the farm chasing woodchucks and shooting starlings in the barn. It was all part of growing up for me. Rifle options back then were relatively limited, but not today. One of the newer ones that just arrived is the Rossi RS22. It’s a semiautomatic complete with an all-weather synthetic stock and blowback action—all for an affordable $139 suggested retail. Based on the same platform as its bolt-action counterpart, the gun is made in Brazil and illustrates how modern gun manufacturing has become worldwide. All of the metal parts are nicely machined. The 18-inch barrel is free-floated and has a satin finish and a target crown. 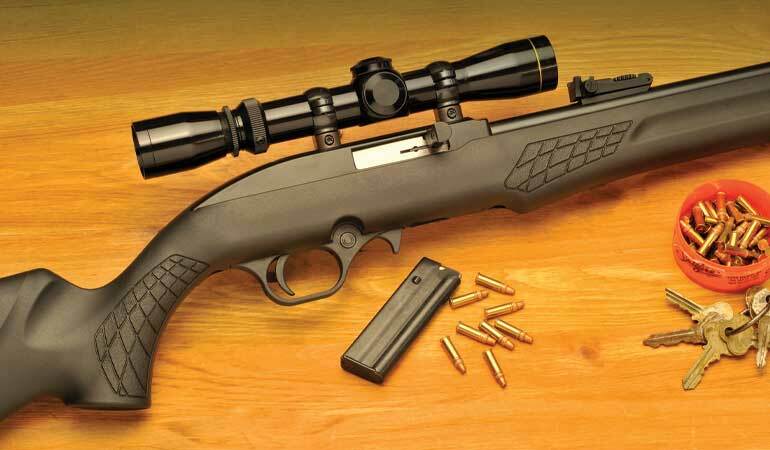 Many rimfire shooters prefer open sights, and the front sight has a high-visibility orange fiber-optic insert. It is well protected with a rather large hood ventilated on three sides to allow natural light to illuminate the insert. If for some reason you don’t like the bulk of the hood, it is removable. 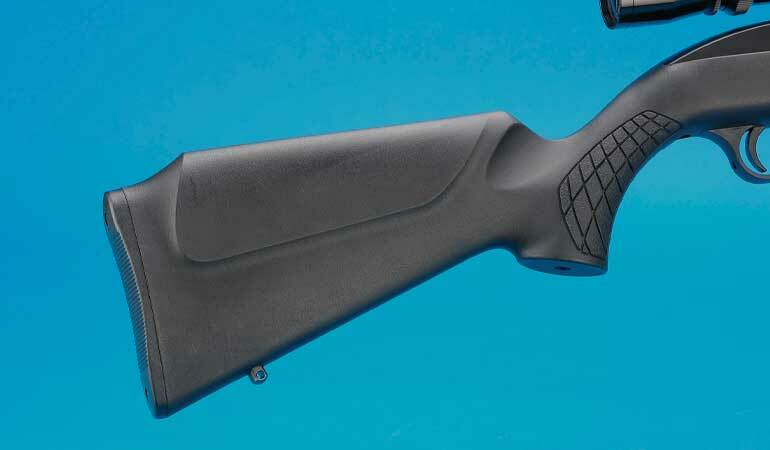 The black synthetic stock is well done, with impressed checkering in the wrist and fore-end and a cheekpiece that can be used by righties and lefties. 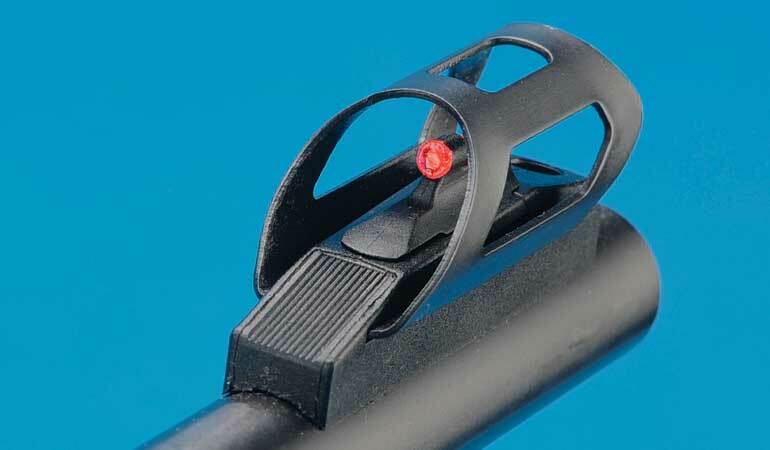 The rear fiber-optic sight is the perfect refinement for both young and older eyes, and to this end, there is a pair of brightly colored green bars that when matched to the front sight offer a “three across” method of target acquisition. However, what really sets this rear sight assembly apart from others is that you can adjust both windage and elevation via large knobs without a screwdriver. If you prefer a clean barrel, both sights are removable. But be careful on the rear assembly because the spring that powers the elevation adjustment will fly out and into the unknown. Been there! Interestingly, the rear sight has been adjusted at the factory before shipment for a 25-yard zero using standard velocity ammunition. The action is the typical blowback operation with a receiver contour that follows most semiautomatics today. 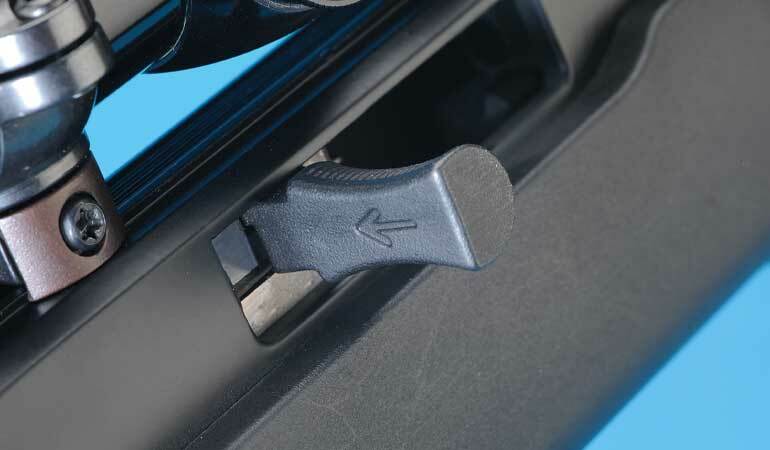 The rear of the receiver is rounded, and for those who use open sights, your eye follows right to the rear sight. On top is the common and integral 3/8-inch dovetail scope mount, which allows easy installation of any optical sight with an objective lens up to 32mm. For this application, I mounted a Leupold Vari-X RF Special 2-7X in Leupold tip-off mounts. On the right side of the receiver is the ejection port and cocking lever. While the gun stays open after the last shot, you can close it by simply pulling out on the cocking lever allowing it to move forward. The fiber-optic front sight is protected by a removable hood and matches up with a fiber-optic rear. The magazine holds 10 rounds and is released by a lever positioned in front of the trigger guard. It’s curved to accommodate your thumb as you grasp the rifle; rotating it forward releases the magazine for reloading. The safety is located in the polymer trigger guard and is the usual crossbolt design. Trigger pull ran 6.5 pounds with a bit of creep before the sear let go. The stock is black synthetic, and though it looks like a stock meant for young people, it is proportioned to an adult. Length of pull is a full 13.5 inches, and the cheekpiece is designed so it can be used by righties and lefties. Overall, I found the stock very comfortable to hold and shoot thanks to the aggressive checkering pattern on the pistol grip and fore-end. Forward of the checkering on the fore-end, the stock has finger holds, and it has some added bulk that assists a steady hold while shooting offhand. Comb height is just right for a scope, and with a little downward pressure on your cheek, the adjustable or iron sights come into view. To finish off the stock, there is a serrated plastic buttplate, and sling swivel studs are included. On the range, the gun was a blast to shoot. In fact, I had so much fun with this Rossi that I left it in the Jeep and took it out numerous times. Shooting from the bench at 50 yards gave me some fine groups, and offhand shooting at clay targets further out proved enjoyable. The bolt locks back on the last shot and can be closed by simply pulling out on the cocking lever. Pushing in the direction of the arrow locks the bolt back. While the averages for the CCI Varmint and Mini Mag were closing in on 1.5 inches, as you can see in the accompanying chart, the Winchester proved the winner for the session and turned in the tightest string of 0.7 inch. I have to say that over the span of a few weeks at the range, the gun was pleasurable to shoot and never gave me any problems. With an overall weight of a tick over five pounds with a scope, it will be fun to carry in the field. Considering the great price point, inherent accuracy and the fun this Rossi generates, I’d say buy it.